The weather has been clearing up lately and that means more play time outside! I’ve been very busy as of late visiting friends from all over the District. Since my last post I visited St. Ambrose Catholic school as their “Fun Day” was taking place. Then I visited my friends from Challenger Baseball at Georgetown Prep where I got to pitch and play the field a bit. Recently I attended “Bike to Work” day in which I was sure to ride my bike to Nationals Park. Manny Acta and I stopped by Kimbal Elementary School to stress the importance of reading to elementary school students the other day. I love to read and I had to share with the school my love of reading. 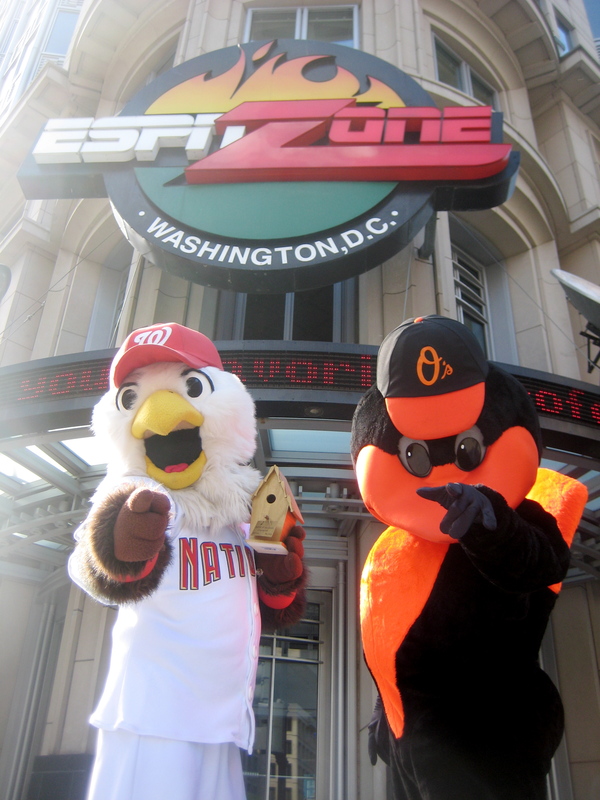 Recently, when we played Baltimore, the Orioles Bird was in town for a friendly competition at ESPN Zone called “Battle of the Birds.” At the battle, I was able to defeat the bird in a basketball, football and arm wrestling competition. And for my great accomplishment, I won the “Golden Birdhouse!” It’s been a busy few weeks, and I will only get busier. Next weekend I’ll be in Texas to visit my friend Captain of the Texas Rangers for his birthday party!